The American people aren't the only ones mourning the loss of former President George H.W. Bush. 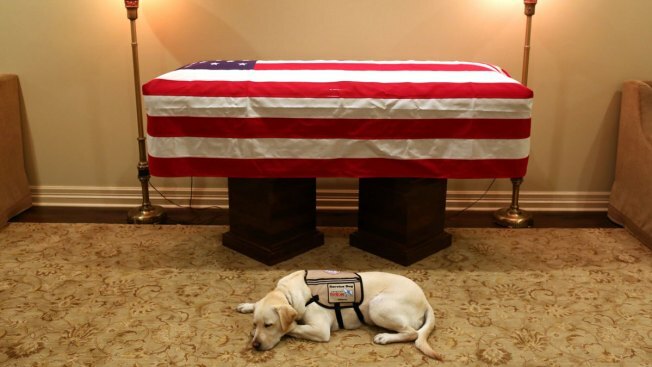 Sunday night, Bush family spokesman Jim McGrath tweeted a photo of Bush's service dog, Sully, lying in front of the 41st president's flag-draped casket with the caption "Mission complete." Bush received the 2-year-old yellow Labrador retriever in June from America's VetDogs, a nonprofit organization that helps match service dogs with veterans, active-duty service members and first responders with disabilities. The president had a form of Parkinson's disease, and Sully could open doors, pick up items and summon help. Sully even accompanied Bush to the polls when he voted in the November midterm election. George H.W. 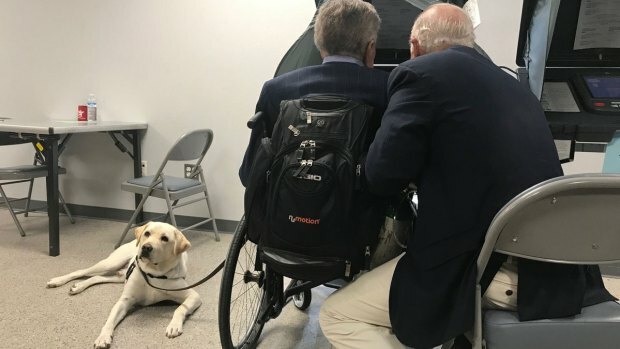 Bush votes in the 2018 midterm elections with his service dog, Sully, by his side. Now, Sully will go back to America's VetDogs in New York where he will stay through the holidays before joinging the Walter Reed National Military Medical Center's Facility Dog Program in Bethesda, Maryland. The four-legged companion will work with other dogs to help with physical and occupational therapy for wounded soldiers and active duty personnel at the hospital. The president and CEO of America's VetDogs, John Miller, issued a statement on the death of President George H.W. Bush. "Our thoughts and prayers are with the entire Bush family during this difficult time. It was truly an honor to have provided service dog Sully to be by the president’s side for the past several months. As a true patriot and a visionary, President Bush will forever be viewed by people with disabilities and their families as a hero through his efforts to enact the Americans with Disabilities Act. We are forever grateful to his service to the American people."